29 Jun 2017. I turned right into the tree-flanked road going downhill, and realised that was it. 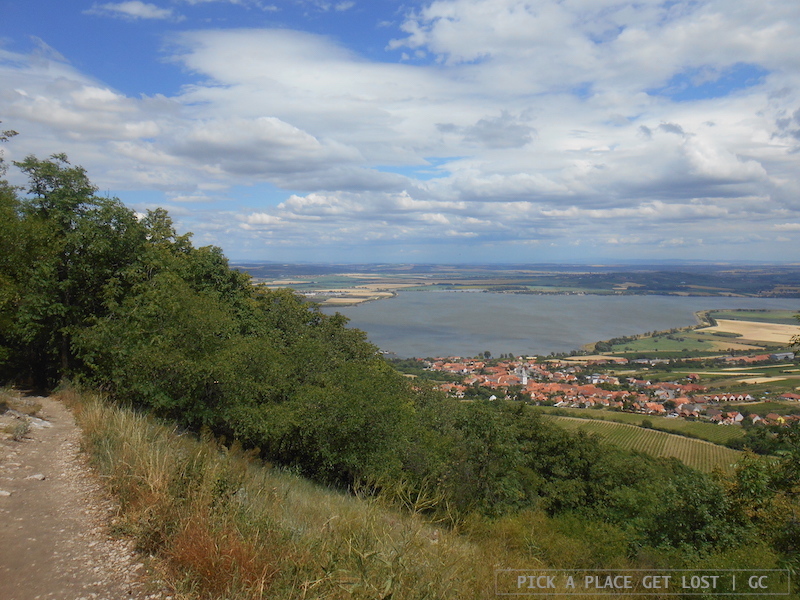 I’d walked/hiked all the 18ish km of the Pálava Red Trail from Mikulov to Popice. I was tired beyond exhaustion, and I still didn’t know I’d have to find a way to make it back to Mikulov in time to board at least the 18.10 bus to Brno, the 17.10 one being already technically gone. 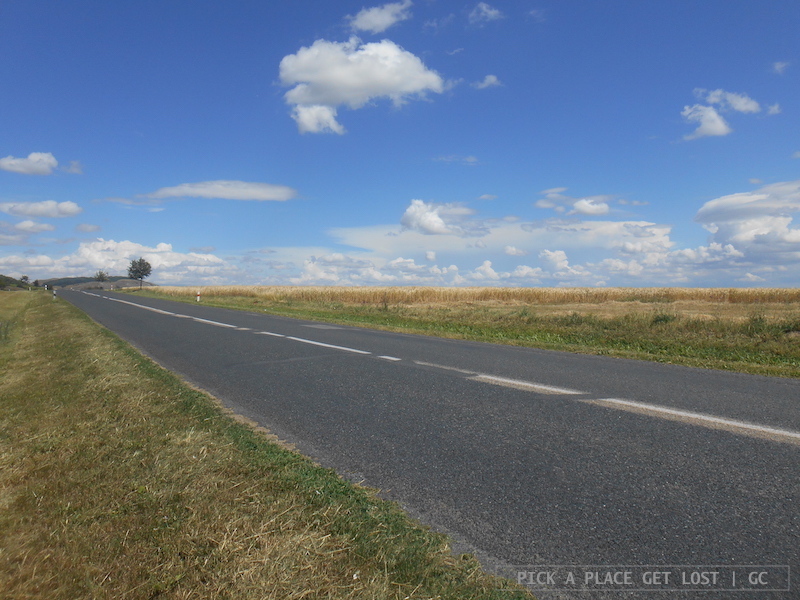 The road was beautiful, neatly lined with trees, wheat fields and cornfields stretching on opposite sides of the road as far as the eye could see. 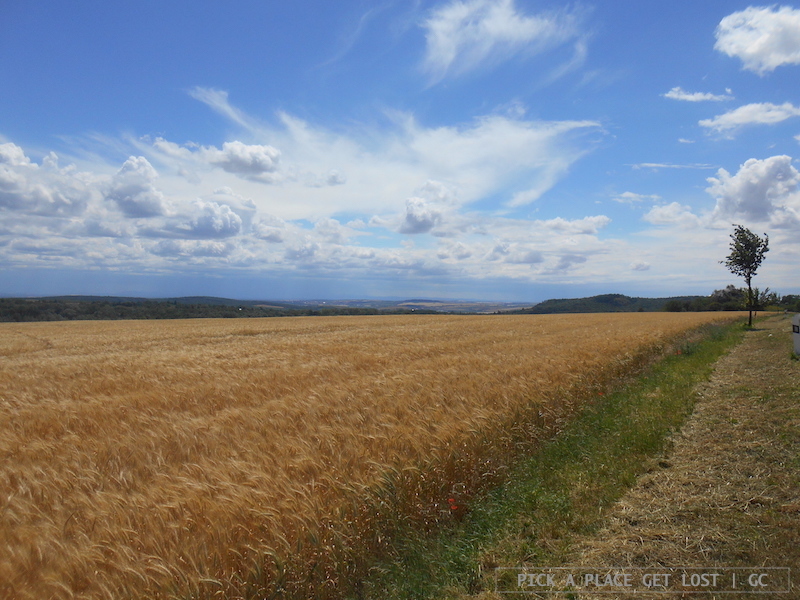 I can quite positively say I’ve never seen as broad and seemingly borderless wheat fields as along the Red Trail. But then, the degree of amazement remained fairly high throughout the whole trail, and I would struggle more than a bit if I had to rate the sights I enjoyed and the countless views I took photos of during the day. 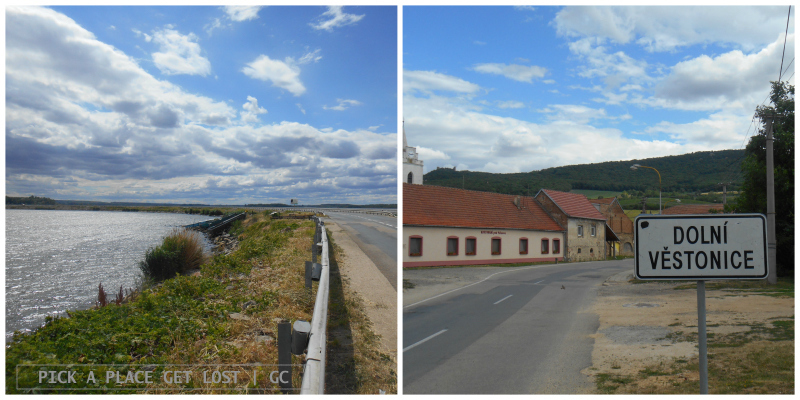 It all started around 10 o’clock in the morning, when I got off bus 105 outside Mikulov train station. I was still moderately sleepy from the nap I’d taken on the bus, and rather lost as to where I could find some proper information on the trail or, possibly, the city centre altogether. 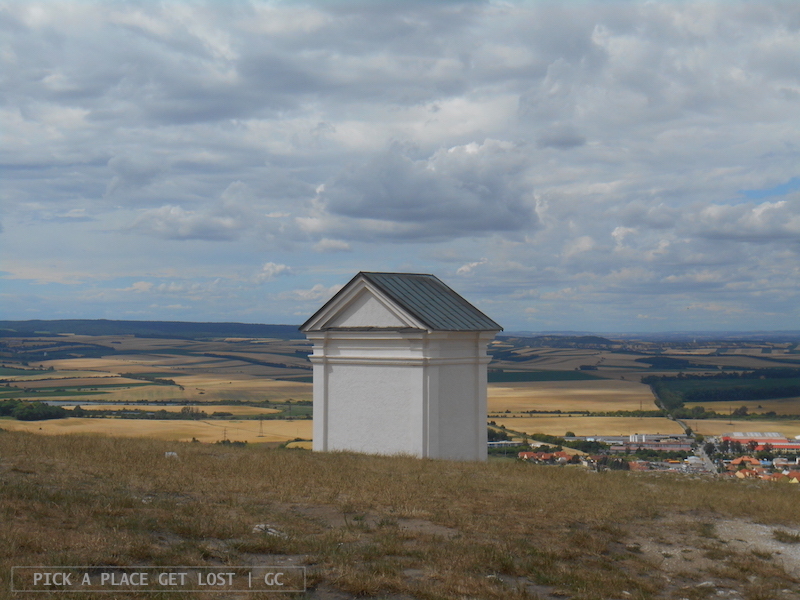 ‘Thanks’ to my phone’s crappy Internet signal, I couldn’t download the screenshots of the Mikulov area I’d made the day before, so I was rather clueless as to which direction I should pick, when leaving the train station. Thankfully, all streets in Mikulov seem to take to the city centre, so finding my way and getting hold of actual maps (one of them being the very map I’d carefully – and pointlessly, with hindsight – screenshot the day before) turned out to be easier than expected. I want to go everywhere, was my instinctive reaction when I sat on a bench outside the info centre and precariously unfolded the map on my legs to mark some key spots I couldn’t miss out on. Mikulov looked lovely, the street leading up to the main square flanked by polished, brightly coloured buildings, each erected in its own style and colour scale. 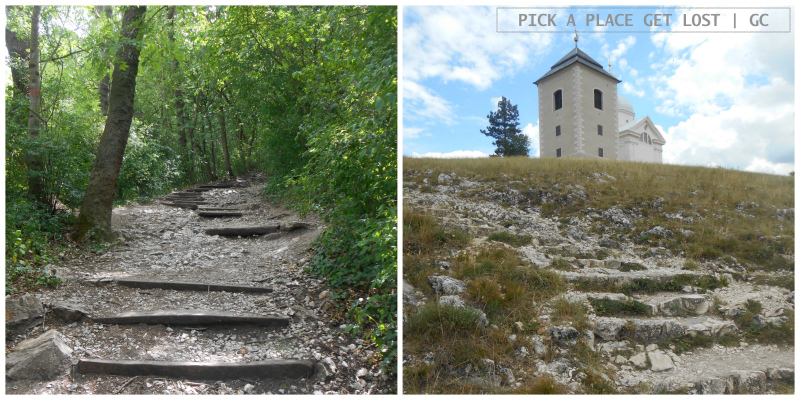 I had a (quick) look around, then I decidedly headed for the first point of interest on my list, Svatý kopeček (Holy Hill). Svatý kopeček is exactly what the name suggests, i.e. a hill in the most elementary meaning of the word. From the square it looks like the hills you would draw as a child, green and ‘panettone-shaped’ with buildings precariously standing on its slopes in defiance of any gravity law. In one word, a ‘Peppa-Pig-style’ hill. The hill is scattered with tiny little chapels depicting sculpture scenes from the Calvary, while at the very top stands the chapel of Saint Sebastian in all its whiteness. I did not ascend the hill for religious purposes. 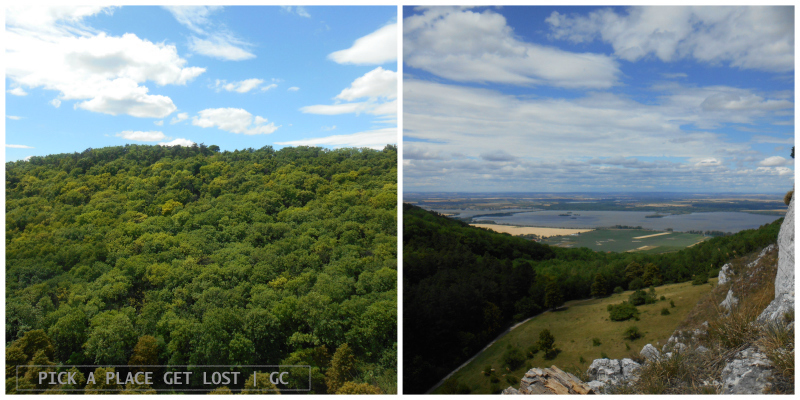 In fact, I was aiming for the view, which does make the ascent worth the effort. From the top Mikulov looks like a blanket of red roof tiles casually draped over the white buildings lying underneath. The pale sun filtering through the clouds turned the air pearly, almost silver-white. It looked perfect. 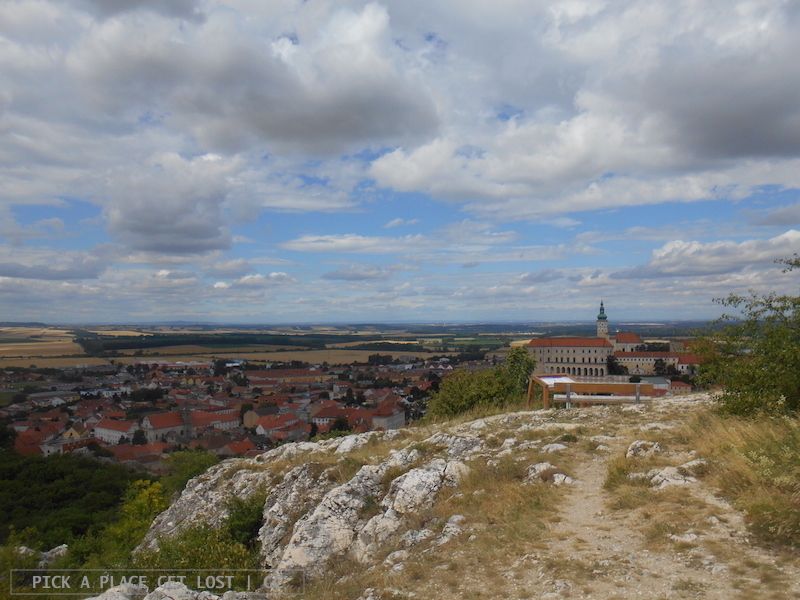 I soon grew to realise that by my very own standards of solo hiking, there were far too many people around, so I quickly resolved to leave Mikulov centre and follow the Red Trail from the map. Which, as it happens, is actually very easy, even though you’re only vaguely familiar with its numerous landmarks. Which, as it happens, are almost evenly distributed along the way. From Svatý kopeček I followed the signs pointing to the ‘Na Turoldu’ caves. 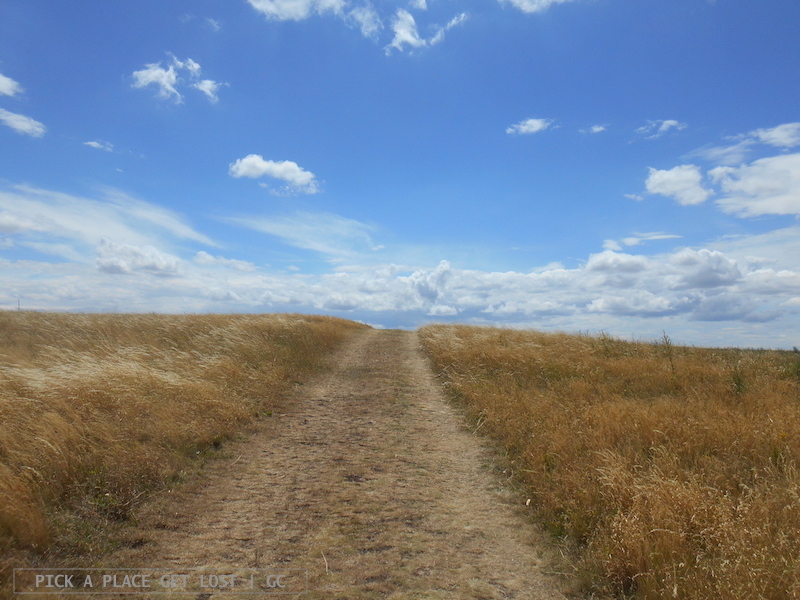 At first I thought I’d visit them, but then I thought better of it, not because it wouldn’t be worth, but because I had no clue how long the visit would take, and my actual priority was to make it as far as I could down the trail. From the caves the red signs take you up a seemingly ordinary, average narrow trail. For a good half an hour (or was it longer?) 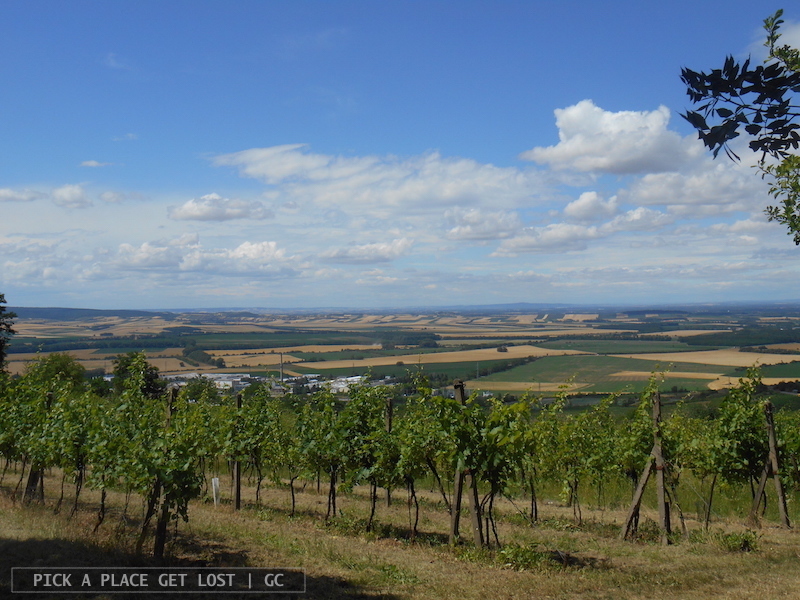 the standard landscape invariably consists of trees on the right and vineyards on the left. Then, unexpectedly, a road cuts off the trail. The trail ends without warning, just like that, with dry earth turning into asphalt. No fear, though: you will soon notice the odd red sign here and there, instructing you on how to turn left and just follow the main road. First, allow yourself a few minutes to take in the huge amount of nature you happen to be surrounded by, i.e. vineyards, meadows and wheat fields. That’s it. I was truly mesmerised by everything, equally struck by the light (as bright as sunlight can get on a gloriously windy summer day, i.e. 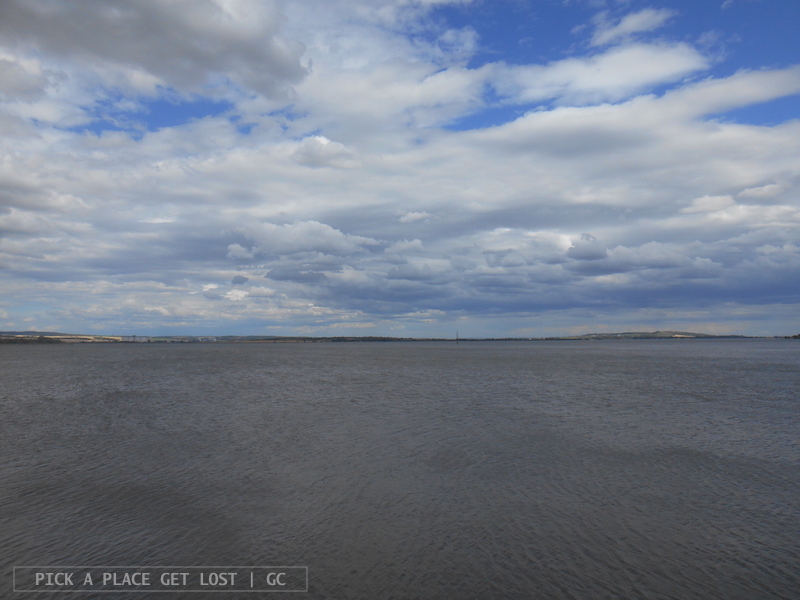 VERY bright) and belittled by the 360-degree view. The hill slopes depicted a perfectly two-toned landscape, where the green of the grass and the trees was neatly juxtaposed to the yellow of the wheat fields. And I’m talking about a perfect juxtaposition: no smears, not the tiniest. Speaking of which, I could write a whole paper about wheat fields, and I’d still have something left to add on the subject. First of all, they are the colour of gold. When it’s sunny, the spikes are all shiny and glossy, but wait for the sky to cloud over even by the tiniest bit, and they all go pale and opaque, as if seen through a filter. Second, a wheat field does look like the sea from above. Not long after I started following the road, I glimpsed a lonesome protruding rock on the opposite side of the road. 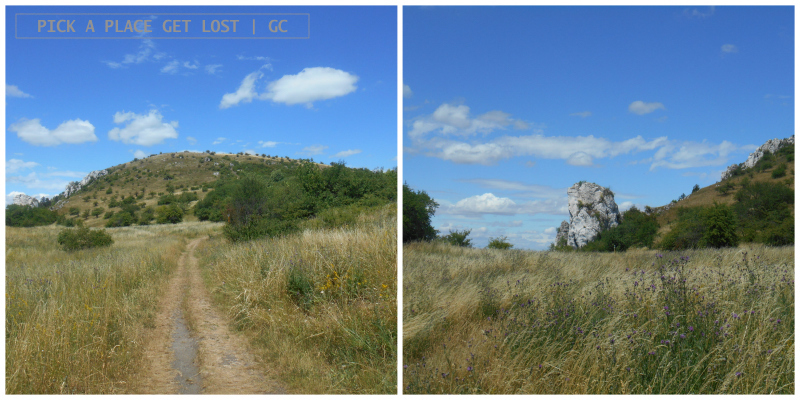 As I crossed over, I realised I’d reached Kočíčí skála (Cat Stone), i.e. one of the Red Trail spots I’d labelled as ‘to see’. 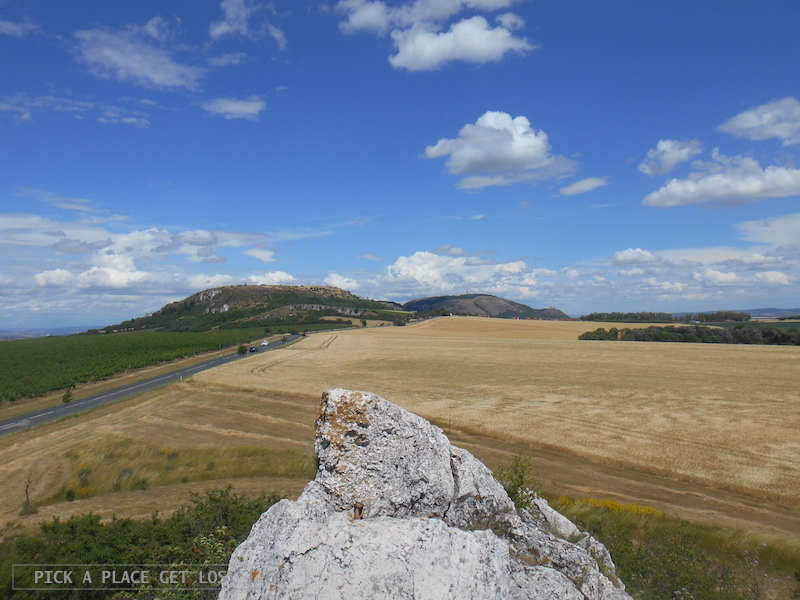 I climbed the low rock, sat on its top and stared at the wheat fields below like transfixed. A strong wind blew, and the spikes were casually floating about, making the field all wavy and shaky. They looked weightless and much softer than the scratchy feel you actually get when you brush your palm across the field surface. Third, they make a rustling noise, kind of like a whisper, but one that grows louder as the wind blows harder. 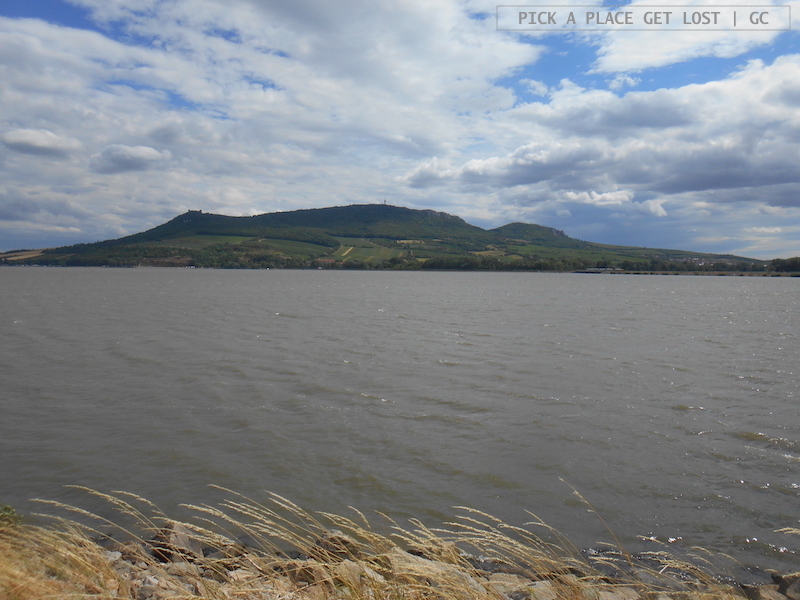 While I was around Pálava, the wind blew hard the whole time. Shortly after Kočíčí skála, my phone lost its already precarious Internet signal. I was disconnected, it said, and if I wanted to be reconnected, I was going to have to pay some extra fees or whatever. Right then and there I felt I didn’t care enough anyway, and turned off Internet altogether. Sometimes being disconnected is the only way, and it feels good. 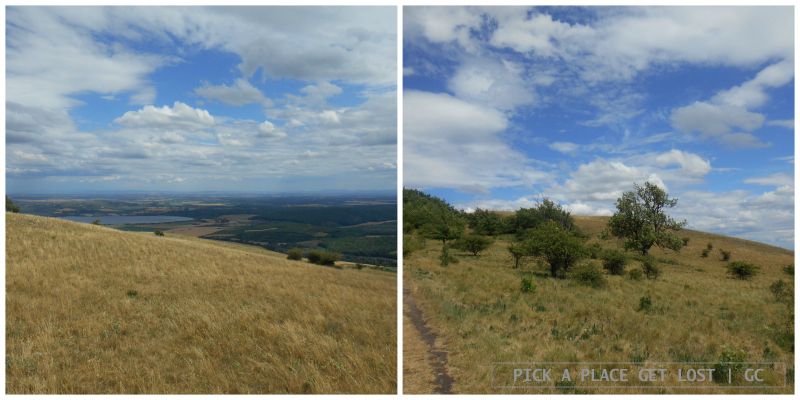 Soon after that, the ascent to Stolová hora (Table Mountain) began. Stolová hora turned out to be one of my favourite spots along the Red Trail. a bit further on, the ruins of Sirotči hrad (Orphan Castle), appearing through the trees. Also blame it on the sky, all scattered with white, shapeless clouds, made fluffier by the wind. Clouds are so beautiful. I like how they bring out the actual spaciousness of the sky, the opposite of ‘the flat hostile blue of a midsummer sky in bright sunlight, a blue that shuts you out’, as Margaret Atwood would put it. Blue sky is nice, but clouds make it nicer. 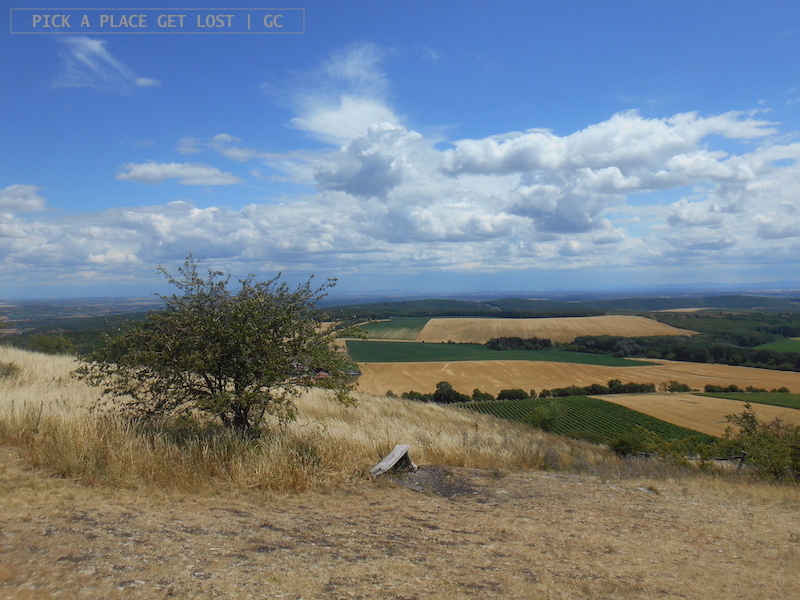 I walked across more vineyards, up what turned out to be the steepest stretch of the trail (though the sea of trees seen from above was priceless) and, finally, to the ruins of Dívčí hrad. The castle is loftily perched on the rocky top of the hill like it owns the place. But then, everybody deviates from the main path to walk the short stretch leading up to the castle, so I reckon its loftiness is somewhat justified. Plus, the ruins are beautifully evocative and, though almost toppled over by the wild-wind-if-not-dust-storm blowing hard, I couldn’t help wondering what the castle looked like in the old days. 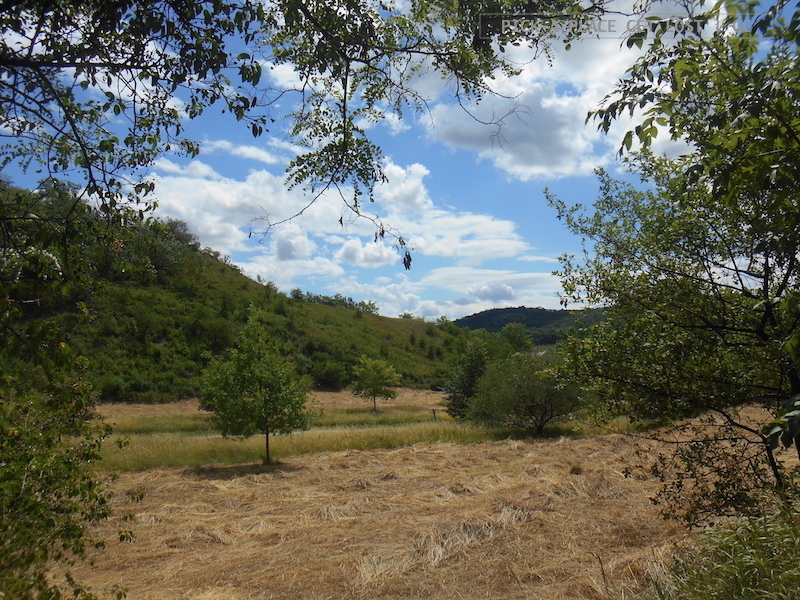 As I trotted downhill, through the woods and toward Dolní Věstonice (where the reservoir was), I was briefly entertained by two middle-aged Czech women, who gravely warned me that a tree had just fallen right across the path. I realised I’d just heard a loud, clicking noise myself, so I put two and two together and figured the noise must have been the tree falling over. My attempts at replying that I’d carefully dodge the trunk lying on the earthy ground, were either unclear or ignored altogether. In fact, they were met by additional remarks on the fallen tree (‘Spadl strom! Spadl strom!’), matched with pointing and gesturing toward said tree. I wanted to say again the message was clear, but I feared there would be more pointing and gesturing, and I hoped I could reach the ‘lake’ before more trees fell over, so I enthusiastically thanked the women and left. I briskly paced downhill and quickly made it to Dolní Věstonice. Then I had this memorable Forrest-Gump-like moment, where ‘I figured, since I’ve gone this far, I might as well’ cross the bridge. So I crossed the bridge. All the way to the other side I kind of struggled to even stand, so hard the wind was blowing. The view, though, was quite something, what with the creased water surface, the ever-changing sky and the castle ruins still visible in the distance. 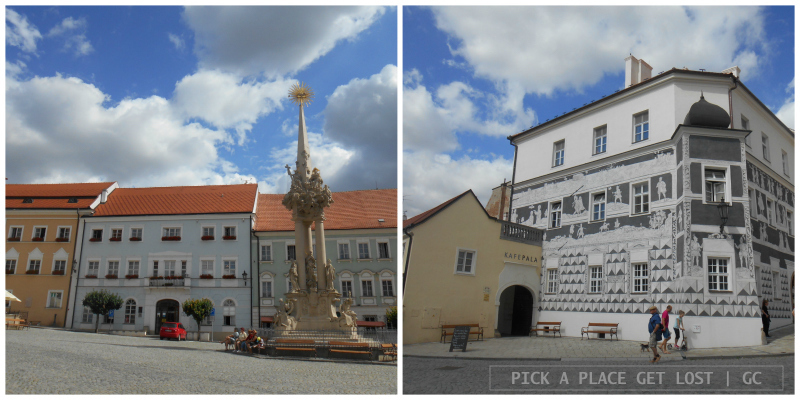 Then, at the very end of the bridge, I entered the tiny village of Strachotín. As I walked down the main road, I heard a trumpet playing and noticed a church on the right-hand side of the street. ‘Niice, there’s a band playing, how cool!, I thought, only to realise a funeral was just about to start, and the music must have been some (particularly lively by the sound of it, tbh) march. I put on a grave face and silently walked on, while fumbling in my bag for my sandwich. 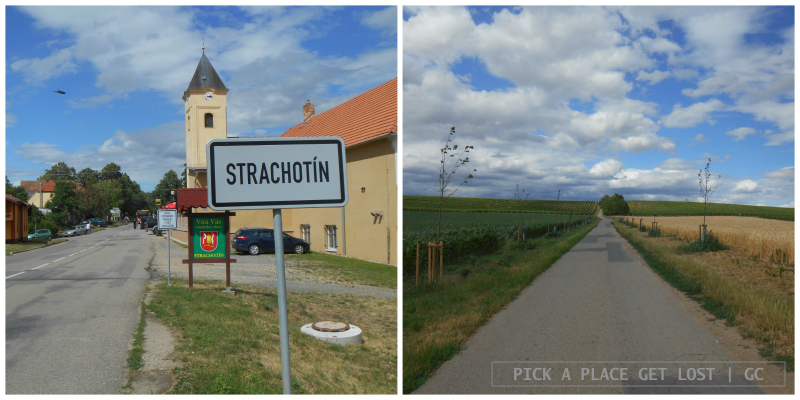 A bunch of kilometres of fields and vineyards separate Strachotín from Popice, the ‘finish line’ of the Red Trail. 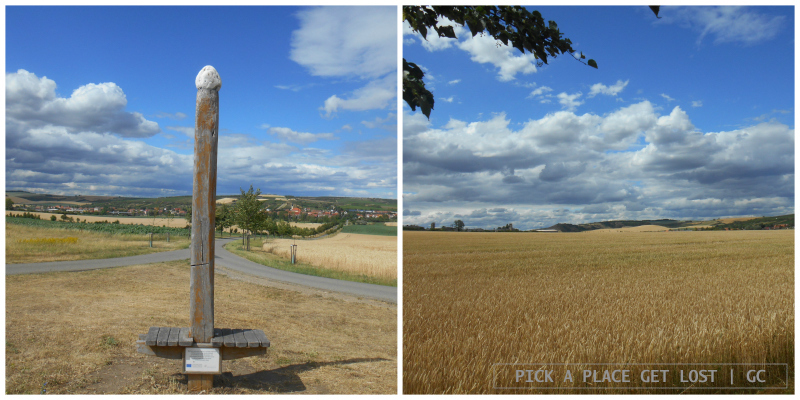 Shortly before getting there, I walked along a perfect stretch of vineyards (duuh) and past a kind of wooden bench-monument supposedly resembling a match, but in fact suspiciously phallic-shaped (but then again, it’s the Brno area, no surprises here). That’s when I turned right into the tree-flanked road I mentioned above, and I was there. 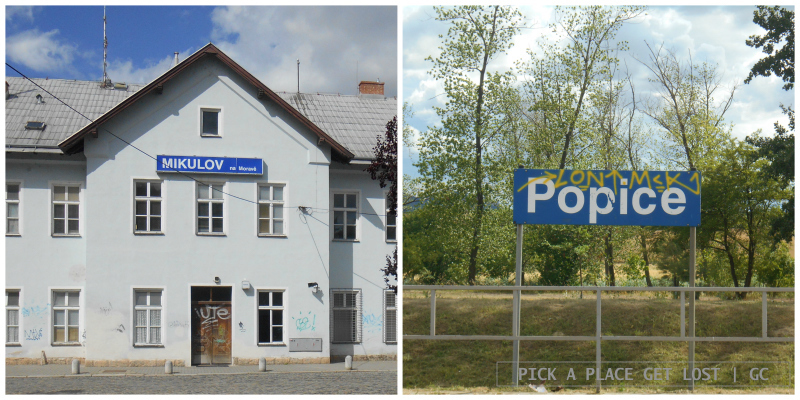 Popice looked surprisingly deserted and signless, which obviously didn’t help when my clueless self had to figure out how to get back to Mikulov. The train station was empty (but thank you Bobby for checking out train times from afar), and the one bus stop I came across only showed unfamiliar place names. After asking twice (to the only two people I found along the way), I reached a (deserted) bus stop near the fields, and patiently waited a good 40 minutes for the (only) bus to Mikulov. So I made it back in time to board my 18.10 bus to Brno. As I sat on the bus and recollected random bits of the hike, I thought how funny time is, and how eight hours can feel like a week-long day. Because that was how I felt, and morning felt like it had happened ages before. And I also thought about butterflies, and the countless pairs of colourful flapping wings I’d glimpsed and spotted and photographed along the way. 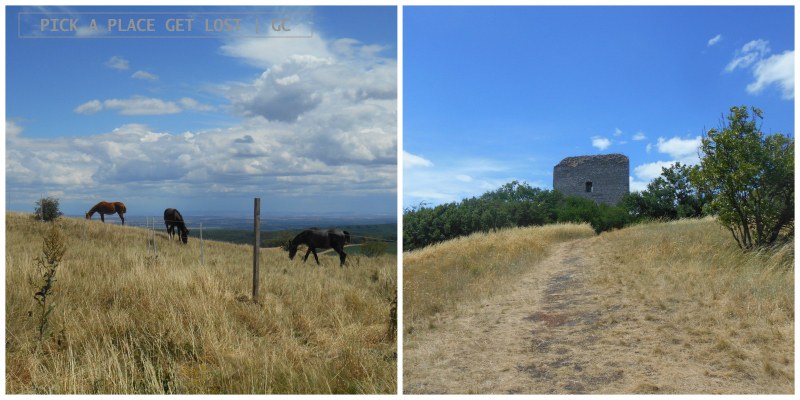 I’m aware that so far I’ve only hiked a small portion of the overall Pálava area. However, if the Red Trail is to give an idea of the landscape standards of the region, I have to say that my expectations have rarely been this high. 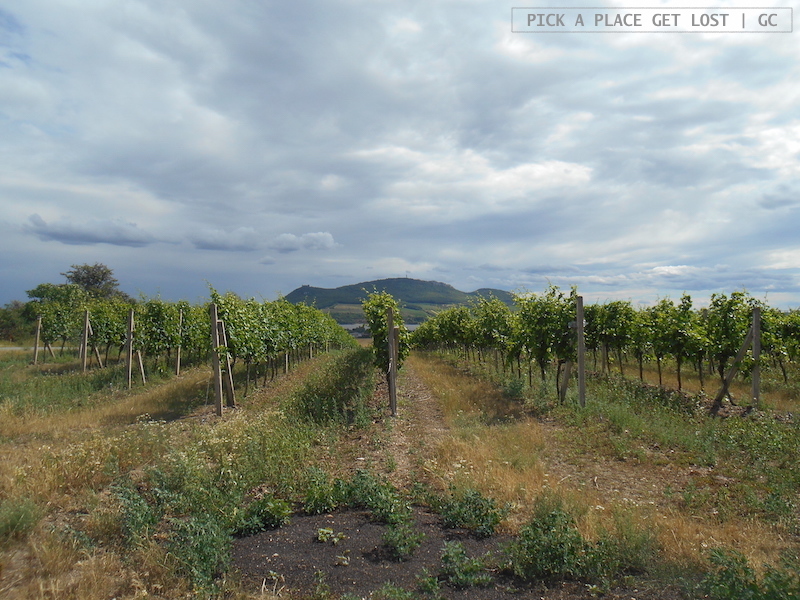 This entry was posted in Czech Republic, South Moravia and tagged mikulov, pálava, pálava red trail, south moravia, vineyards by Giorgia. Bookmark the permalink.